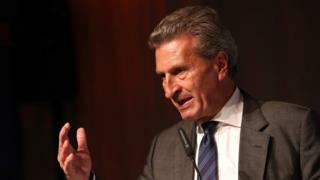 The EU's Digital Economy Commissioner Guenther Oettinger has drawn scathing criticism for a speech condemned as "racist" and "homophobic". The German official has been named as the next EU budget commissioner. His controversial speech was addressed to business leaders in Hamburg last week. He caricatured a Chinese official delegation as "nine men, one party, no democracy", all with "hair combed from left to right with black shoe polish". Critics say he is unfit for his EU job. An amateur video, uploaded to YouTube, showed part of Mr Oettinger's speech. There was some laughter after his comments about the Chinese. The video's author, publisher Sebastian Marquardt, said he began filming after Mr Oettinger spoke about "slitty-eyed rascals" determining international trade rules. According to Mr Marquardt, the context was that Europe had been shown to be incapable of negotiating free trade deals successfully. Mr Oettinger was speaking scornfully about the EU's battle to get Belgian approval for the landmark Ceta trade deal with Canada. Further on in his speech, Mr Oettinger lashed out at the political agenda in Germany. He said that the agenda consisted of "mothers' pensions, minimum pensions, pensions at 63, welfare payments... soon it'll be compulsory gay marriages". Before becoming an EU commissioner in Brussels, Mr Oettinger was a senior politician in Germany's ruling centre-right Christian Democrat CDU party. He is set to take over as budget commissioner from Bulgaria's Kristalina Georgieva, who resigned last week in order to become CEO of the World Bank. Defending his speech later, he told the German daily Die Welt that he had "spoken rather sloppily" about the Chinese, but "in no way was it intended to be disrespectful to China". He said his point was to warn Germany against "too much self-confidence" and the video clip had distorted the overall context of his speech. The secretary general of Germany's centre-left Social Democrats (SPD), Katarina Barley, condemned the speech, saying "someone who openly spreads racist and homophobic opinions disqualifies himself from top political posts". That was echoed by the Greens in the European Parliament, who tweeted that "with his statements, Oettinger has disqualified himself from representing the Commission". The Socialist leader of Wallonia, the Belgian region that raised objections to the Ceta deal, also joined in the attacks on Mr Oettinger. Belgium's Le Soir newspaper quoted Mr Oettinger as saying "a micro-region run by Communists that blocks the whole of Europe - that's unacceptable". Walloon Prime Minister Paul Magnette tweeted that those remarks were "unworthy of an EU commissioner - the Walloons deserve respect". The EU and Canada finally signed the Ceta deal on Sunday, addressing Walloon concerns by attaching some extra, legally binding clauses. The deal took seven years to negotiate.